The 23-year-old faces the gallows on Thursday morning if clemency is not granted. Less than 24 hours before Shafqat Hussain faces the gallows, rights groups in Pakistan and abroad are hoping President Mamnoon Hussain will hear their pleas and either pardon the 23-year-old or, at least, stay his execution pending further investigation. “The president has the power to provide either [option],” says Shahab Siddiqi, the communications specialist with JPP, which has been leading the campaign to secure justice for Hussain, who was convicted of murder and sentenced to death when he was 14 years old. Hussain allegedly murdered a seven-year-old child, Umair, in 2001. Three years later, acting on a confession obtained through torture and coercion, an Anti-Terrorism Court sentenced him to death. Subsequent appeals for mercy were rejected by the Sindh High Court in 2006, the Supreme Court in 2007, and then-president Asif Ali Zardari in 2012. Attempts to secure mercy for Hussain through Pakistan’s controversial qisas laws, which allow the payment of blood money to families of victims, have also failed. “We spoke to them [Umair’s family] in January and asked them to forgive Shafqat but they were very hostile,” says JPP’s Siddiqi. “They are not willing to compromise because they think the execution will give them closure,” he added. Initially scheduled for execution in January, shortly after the government ended a moratorium on the death penalty, Hussain was saved due to overwhelming public and international pressure, prompting Interior Minister Chaudhry Nisar Ali Khan to delay the hanging and order an inquiry into the case. “He [Khan] promised us he would investigate, that the case would be reopened,” Manzoor Ahmed, Hussain’s elder brother, tells Newsweek. “Nobody has contacted us, nobody from the government has seen Shafqat in jail. They won’t even let us speak to him,” he added. Justifying the government’s decision to proceed with the sentencing, Khan claimed in the National Assembly on Tuesday that police records showed that Hussain had been over 20 years old when he was convicted of murder. However, a birth certificate issued by the local government of Pakistan-administered Kashmir disproves this. “Chaudhry Nisar said we didn’t send any documents [corroborating our claims] but JPP has sent them everything. 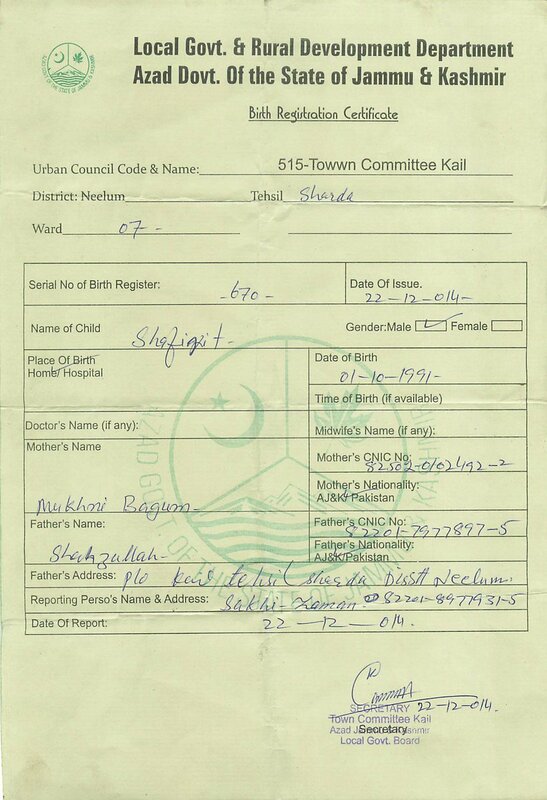 He has the birth certificate but he hasn’t taken any action. What else can we give him?” questioned Hussain’s brother Ahmed. “The government isn’t listening to any appeals, it’s like they have a quota to fill. They don’t care if the person they hang is innocent or guilty,” he added. Hussain’s mother, Makhani Begum, held a press conference on Wednesday in which she reiterated that her son was innocent. She told Newsweek her son had been born at their home with the help of an unregistered midwife. “If I had known it could become a life or death issue, I would have begged her to keep a record of his birth,” she added. The elderly woman lives in Muzaffarabad with her husband, who has been paralyzed since he suffered a stroke, and is unable to visit their son one last time. But with time running out—Hussain is due for execution early Thursday morning—rights campaigners are hoping their protests will offer some hope. An online petition set up by Amnesty International has gathered over 26,000 signatures so far. A similar petition by Reprieve has received nearly 8,000 signatures. Maya Foa, director of Reprieve’s death penalty team has also issued a statement. “Killing child offenders flies in the face of international law and basic humanity,” she said, adding that Pakistan’s own laws forbade the sentencing and execution of juvenile offenders. Social media users on Twitter and Facebook are also hoping to make their voices heard by using the hashtag #SaveShafqat to urge the government to pardon him. If the law says that a person under the age of 18 cannot be hung and if his birth certificate is legal, gallows for the boy will mean that those responsible for taking his life are legally guilty of murder. The law should be followed. If the law recognizes that the convict was below the age where the law of hanging applies then an illegality must not be committed by hanging him. The fact that his conviction possibly rests on a confession extracted under duress and since retracted and there is no other evidence beyond reasonable doubt is also something to consider. We should enforce our laws, uniformly, universally and even handedly. I wonder, if it can be shown that an Interior Minister willfully sat on evidence that may have prevented a miscarriage of justice leading to unlawful killing, could he be prosecuted for murder?